HAVE QUESTIONS ABOUT FULLYRAW JUICE? HERE’S ALL YOU NEED TO KNOW! Just browse through the frequently asked questions and find your answer. If by any chance you have even more questions, feel free to contact us and we’ll get back to you shortly! Are we Houston’s only home delivery organic juice company? YES. 3 days. Fresh is always best. How does the home delivery work? Order by 2 PM, get your order the next day. Boxes will be delivered from midnight to 6 am so that they are on your doorstep when you wake up. This also keeps them out of the Texas heat. They will be in cooler bags to keep them cold. 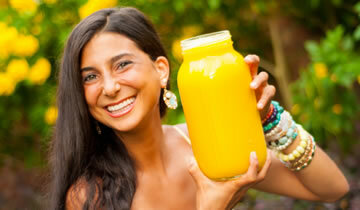 Juice cleanses are fabulous to cleanse your system and get an infusion of readily-available nutrients to your body. Why is FullyRaw Juice different from all of the other juice companies in Houston and Texas? FullyRaw Juice is the only 100% organic raw and cold-pressed juice company in Houston that will be offering home delivery. Made with the freshest produce from our Houston co-operative Rawfully Organic, we make our juices with love! FullyRaw juices are completely raw and 100% organic! No preservatives, no HPP, no solvents, no natural flavors and never heated, only fresh cold-pressed ingredients made straight from fruits and vegetables. Because the juices are fresh, they last a smaller period of time, but are higher in nutrient value and much better for you. Our juices are healing on physical and emotional levels, even if it is bringing a smile to your day! These juices are filed with LIFE to bring you life! Made with fruits and veggies from our local Texas co-operative Rawfully Organic and made with love. What is a FullyRaw Diet, and why is juicing an essential part of living healthfully? A FullyRaw Diet is a diet consisting of ONLY raw fruits and vegetables, organic, fresh, ripe, and local when possible. We do consider it to be an essential part in healthy living. You are able to get in a very concentrated amount of nutrients in a condensed liquid form. See www.fullyraw.com for more information on a FullyRaw diet, recipes, inspiration, and more! For the best source of organic produce in Houston, order online at www.rawfullyorganic.com. Why are FullyRaw Juices different from ALL other juices? FullyRaw juices are completely raw and 100% organic! No preservatives, no HPP, no solvents, no natural flavors and never heated, only fresh cold-pressed ingredients made straight from fruits and vegetables. Because the juices are fresh, they last a smaller period of time, but are higher in nutrient value and much better for you. Our juices are healing on physical and emotional levels, even if it is bringing a smile to your day! These juices are filed with LIFE to bring you life! Made with fruits and veggies from our local Texas co-operative Rawfully Organic and made with love.